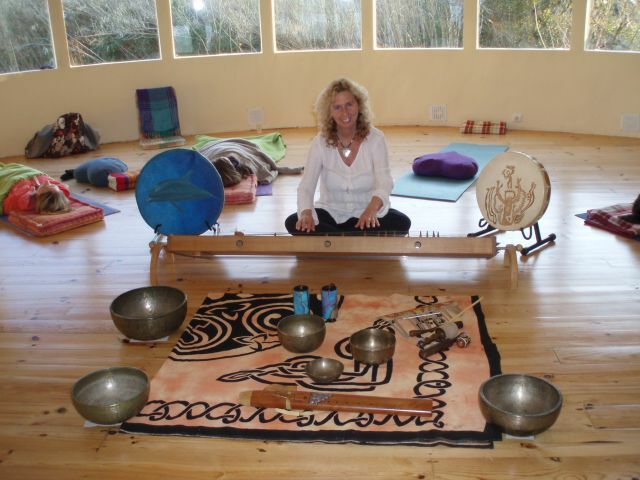 A profound and powerful experience of healing sound and vibration. Participants lie comfortably on mats on the floor, while one or more Soundhealers (sound therapists/musicians) play a variety of acoustic instruments. A sonic environment is created through the specific use of the instruments and the order of their use. Every “Sound Journey” is different, as it is essentially an intuitive, shamanic process, requiring a deep sensitivity for what is needed in the moment. Participants or journeyers are asked to remove their shoes and lie as comfortably as possible, face up, and where space permits, in a circle with heads towards the center. The instruments, including Tibetan singing bowls, flute, Native American frame drum, didgeridoo, ocean drum, rainsticks, tuning forks, kalimba, monochord and others, are placed in the center of the circle. There are many other instruments available, and the experience is more effective if only acoustic instruments are used. The instruments are then played around and over those lying on the floor. Each person gets to feel at the physical level the vibrations of many of the instruments. The sound is kept at a very subtle level, at no time becoming loud or intrusive. The sound is constant, and assists the participants to forget the density of the physical body. The spirit or soul is then free to travel. Sound, especially unstructured sound, bypasses the intellectual, analytical hemisphere of the brain, allowing the creative, intuitive hemisphere to have free reign. There is no guarantee that everyone will enjoy all the sounds, but any sound one objects to will almost certainly be removing or identifying a block on the physical, etheric, emotional or spiritual level. If one goes to sleep, which can happen, the sound will be just as effective, working directly on the physical and etheric bodies, and the unconscious mind. A specific objective can be established before the Sound Journey begins, for example asking to receive guidance in resolving an issue in one’s life, or the solution to a specific problem. Some people receive visions and symbols, or even totem animals. The whole process will take approximately 1½ hours, of which 50-60 mins. will be pure sound. The most important thing is to enjoy oneself! Bathe and luxuriate in the shower of sound.